I just have a lot of feelings about Nintendo mashup fighting games. A bunch of new characters! New modes and online play detailed! Release windows for 3DS and Wii U versions! Last night’s 40-minute Smash Bros. info dump was a lot to take in, so I’ve gathered the main points together for you in condensed form. I’m putting this first, because it was almost an offhand remark tossed in late in the stream as if it’s not a huge game-changer. As a very active member of the Brawl modding community, I know there’s a lot of interest in the Smash community in character customization. The custom moves won’t be usable in online play to keep things fair, but you’ll apparently be allowed to edit the way characters work on your own system in a not-yet-specified manner and use those characters against your friends. That sounds like a whole lot of fun for players who don’t take the game super seriously all the time, which is most of the people who will buy the game. Sakurai promised we’ll find out more about how this feature works at a later time, so at least they left something to show at E3. 2. The 3DS version will be out this summer. The Wii U version will come in the winter. Unsurprisingly, the Wii U Smash Bros. looks to be that system’s holiday system-seller with a “winter” release date announced, but the 3DS version will get the jump on it by coming out at an unspecified date this summer. Personally, I’m extremely excited that the 3DS version will be out so soon, which is, unfortunately, why I still think it’s a mistake from Nintendo’s standpoint. I don’t own a Wii U, and if I can get Smash Bros. sooner on the 3DS, I see very little reason why I’d also buy a Wii U to play it. Like I said, I’m glad that’s the case, because it benefits me personally, since I own a 3DS. However, if Nintendo is hoping to boost Wii U’s holiday sales with Smash Bros., this might not exactly be the best scenario. 3. Both versions will have online play with more features than Smash Bros. Brawl. I nearly had a heart attack when Sakurai said specifically that the Wii U version would feature online play against friends or anyone, because it sounded like the 3DS version would lack that functionality, and then I’d probably have to buy a Wii U.
Luckily, the 3DS will also sport this feature, so I was able to eventually calm down after breathing into a paper bag for a few minutes. Online play will feature two modes: “For Fun” and “For Glory.” For Fun is basically the same as Brawl‘s “With Anyone” mode, but it has even fewer options. All items are always on, and the stage choice is always random. People who are just playing “for fun” probably won’t mind anyway, but it’s weird that it has even less options than Brawl‘s With Anyone mode. Seriously, Sakurai is a troll. More on that in a minute. While For Fun only tracks your wins, For Glory will track both wins and losses and try to match you up with opponents based on relative skill level. I’m happy that they’re expanding the online options and allowing people to decide whether they’re playing seriously or for fun, but I’m still disappointed that the options are so strict. Online functionality was Sakurai’s big chance to perfect the Smash series, and restricting people to complete randomness or complete, Final Destination-flavored sterility seems like a bit of a miss to me. 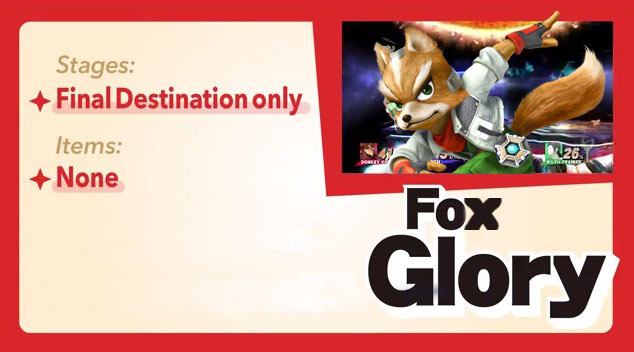 Sure, For Glory mode allows you to pick “Final Destination” versions of most of the game’s stages, but not only does that ignore the fact that a wide, flat stage isn’t an even playing field for all characters, it assumes that playing seriously means a lack of variety. The game would be much better served by a lobby system where you set up a game with the items and rules you want and then players decide what kind of match they want to join with much more of the full set of options available. At least For Glory allows for 1 on 1 fights, but this isn’t the huge improvement over Brawl‘s online system that I was hoping for. 4. Sakurai is gaming’s biggest troll. He teased us all about fan reactions to characters that got cut in the transition from Smash Melee to Brawl by saying that Zero Suit Samus would be cut out of the new games, leaving just enough time for viewers to start writing angry comments on whatever site they were using to watch, and then saying he was just kidding. Man, there are modders out there who still haven’t gotten over the fact that Young Link was cut for Toon Link, and you tease everyone that you’re cutting a unique version of Samus from the game entirely? You might as well just tease us that Ridley will be added to the game when he really isn’t, and then please add him to the game as an apology please. Did I say please? 5. Characters like Zelda/Sheik can no longer switch mid-match. Speaking of Zero Suit Samus, Zelda/Sheik, Samus/Zero Suit Samus, and Pokémon trainer could all swap fighters with a down-special in Brawl, but that feature has been removed entirely across the board in the new games. That’s likely a technical limitation of the 3DS, since Sakurai is committed to keeping the same roster and moves across both games, but hardware limits on the 3DS likely restrict the additional memory space needed to have two characters loaded by a single player for instant switching. Don’t worry; Sheik and Zero Suit Samus are both still in the game no matter how much trolling Sakurai does, but the same can’t be said for Pokémon trainer. Odds are that he’s out entirely, and it remains to be seen whether or not his Pokémon will return… except Charizard. 6. Sheik, Zero Suit Samus, Yoshi, and Charizard will return. Greninja has been added. We got five character confirmations, but only one of them was a brand new fighter. I’m not super excited about a newer-generation Pokémon joining in (or another Pokémon joining the game in general), but Greninja sure looks like a whole lot of fun to play. He’s got some kind of counter move with a substitute, so that’s fun, and he generally looks fast and satisfying to use. Charizard is also returning, but there was no mention of Squirtle and Ivysaur, who were selectable along with him as Pokémon trainer in Brawl. I wouldn’t mind if those two were cut, but I’m a little sad to see classic Pokémon removed in favor of newer ones. I guess I’m just an old guy. Oh, that reminds me: I would be excited about a Pokémon if it was Mewtwo coming back, but that looks pretty doubtful. There was also a whole lot of gameplay footage for those who are really into the series to pore over and try to figure out where the gameplay falls between Brawl‘s floaty physics and Melee’s faster, less forgiving gameplay, but it’s hard to draw conclusions without playing the game for yourself. For more on the newly announced characters, they’ve all been added to the game’s official website with screenshots just like the rest of the cast. The game looks and sounds great, as expected, but some of the stage models still look a little rough around the edges. They’ve got plenty of time to get that sorted out, though, and both games have the main action running in 60 fps (even with 3D on the 3DS), which isn’t just prettier but also completely necessary for a game as fast-paced as Smash. Both versions also look pretty much the same when the footage is viewed on a small screen except for the 3DS’s comic book-style outlines, so 3DS owners are in for a visual treat. Those were only the main points, and there was a lot more information to be had if you watched the entire presentation, so if you’re into Smash, you should check it out for yourself. The last Nintendo Direct announced Little Mac in Smash Bros.
Mario Kart 8‘s new trailer looks pretty great, but does that even matter? Nintendo, Sakurai, Super Smash Bros.